As I’m sitting here at my parents’ home in New Jersey, happily noshing on cheese, crackers and olives (mind you, it’s a little past noon), I’m already thinking about getting back on track, post-Thanksgiving. 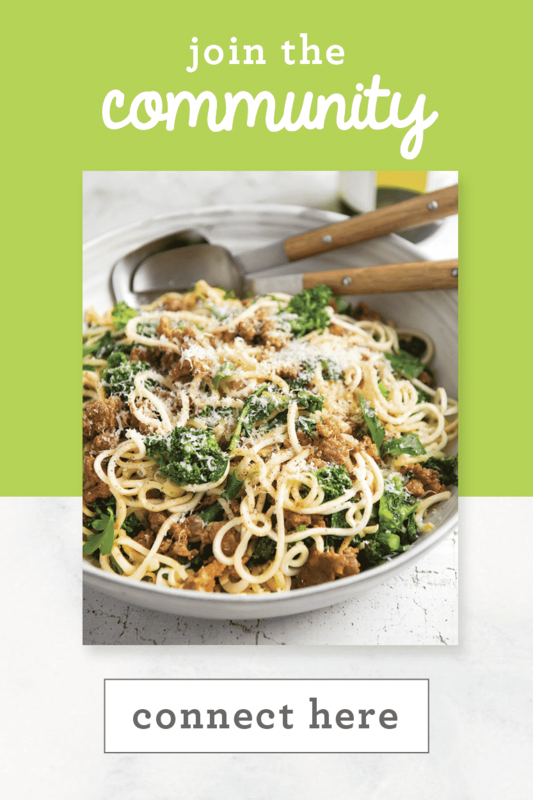 Last year, I shared my “detox” baked chicken and kale zucchini pasta to help with the post-Turkey bloat – and it’s still one of my favorite recipes. Today, I’m giving you another one for your arsenal, that’s jam-packed with delicious flavor and healthful nutrients to shock your system back to norm! Reduces overall inflammation in your body, which will make your entire body feel and work better. Parsnips are high in dietary fiber to fill you up without adding extra bloat and high in Vitamin C, helpful after this cold holiday! Leeks help with blood flow and vascular health, again important after high sugar and animal protein intake. 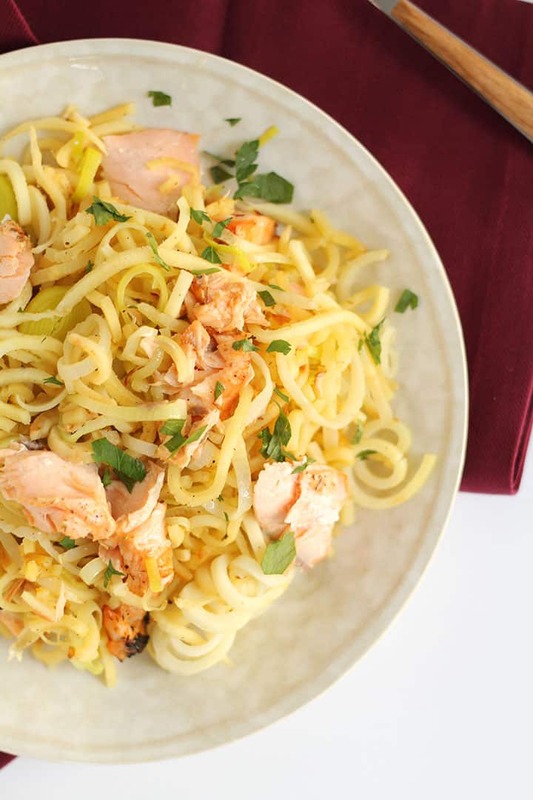 Lemon juice naturally detoxes your body, restores the pH levels in your body back to normal, aids in digestion and is another strong source of Vitamin C.
Basically, this spiralized pasta dish is clean-eating friendly and will leave you satisfied, but able to make that trip to the gym and get your blood flowing again, after hours laying on the couch belly-up. This dish also saves very well in the refrigerator and can be reheated well – the parsnips are resilient and don’t release excess moisture like zucchini noodles do. I’m sure we all enjoyed every minute of that couch time – but now it’s back to reality and time to treat your body with some healthiness! 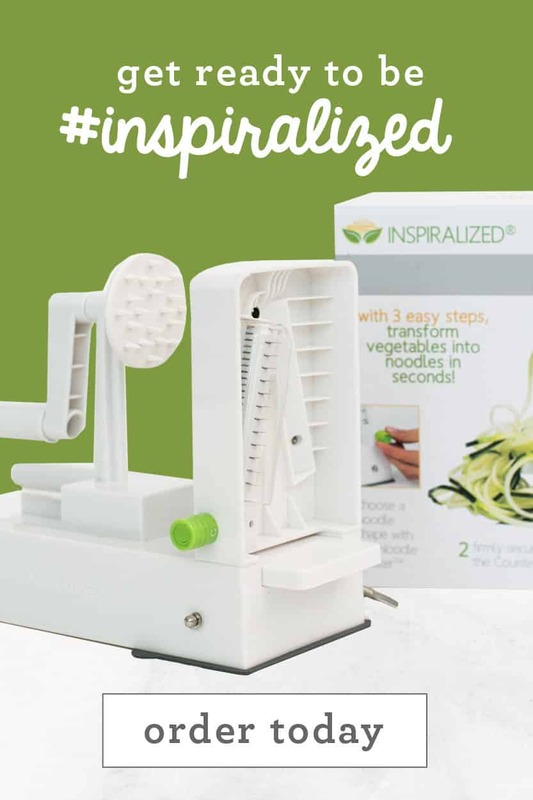 What better way to do that than with a spiralizer?! Preheat the oven to 425 degrees. Line a baking sheet with parchment paper and place salmon in the middle. Drizzle with olive oil (optional) and then splash over the lemon juice. 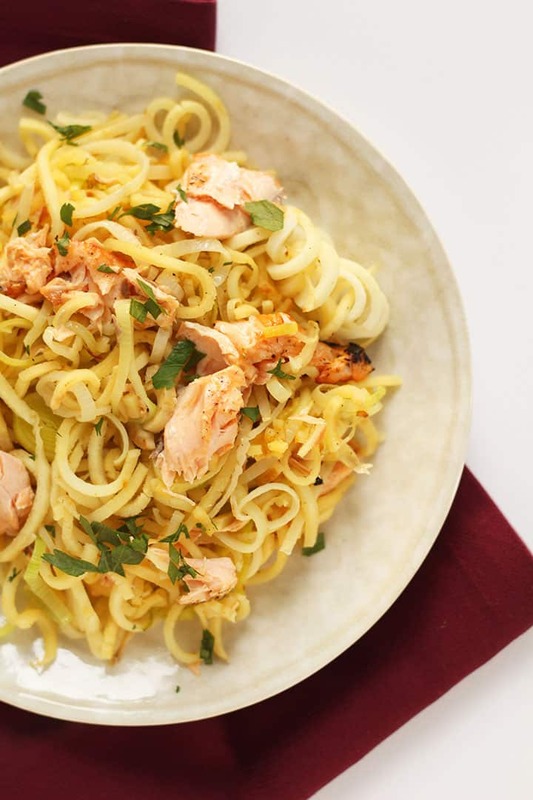 Season with oregano, salt and pepper and bake for 20-25 minutes or until salmon flakes easily with a fork. 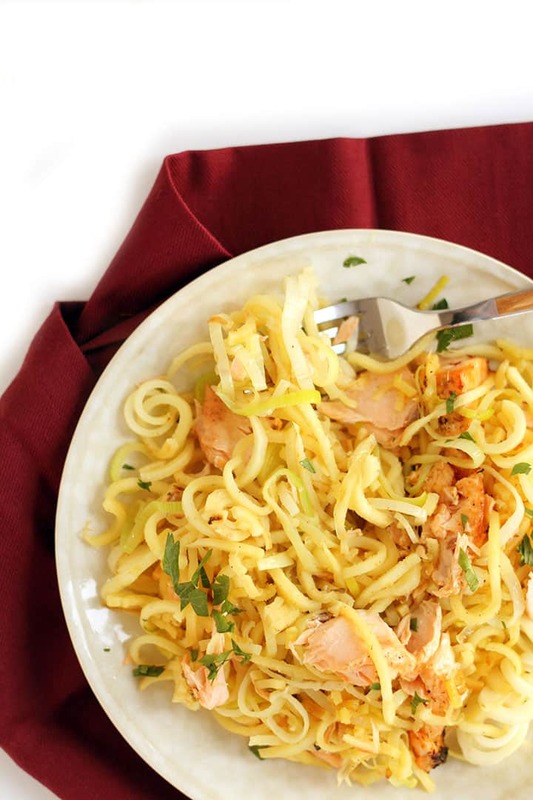 While salmon is baking, spiralize your parsnip with Blade C and set aside. Slice the leek thinly and set aside. Mince the garlic and set aside. Ten minutes before salmon is done, place a large skillet over medium heat and add in the olive oil. Once oil heats, add in the garlic, leeks and red pepper flakes. Let cook for 1-2 minutes or until leeks soften. Add in the parsnip pasta, vegetable broth and cover and cook for 5-7 minutes or until parsnips are cooked through. Once salmon is done, flake with a fork to break into pieces. Add to the skillet with the parsnip noodles, toss and transfer to a plate. Serve with lemon wedge. 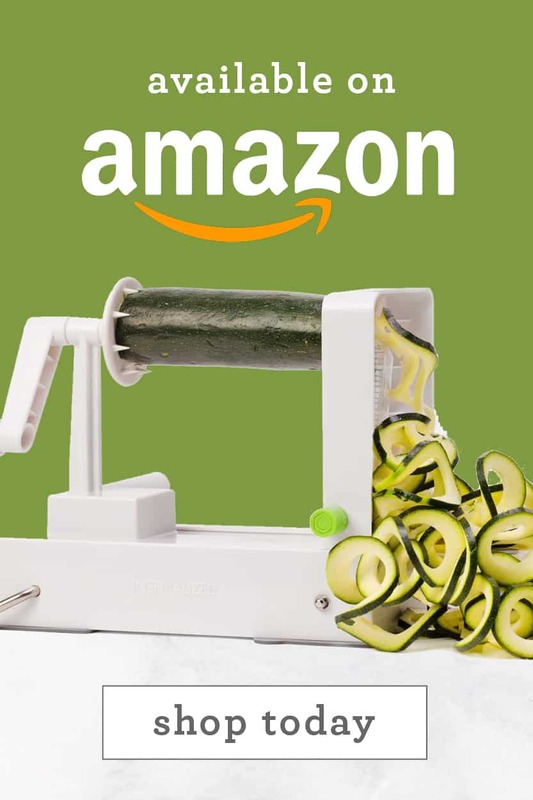 Step 2 says Spiralize your Zucchini. Should say parsnip. Had my coffee this morning! I am going to try this. That is so interesting about the things salmon helps with. I was feeling "post holiday depressed" a little and I bet a lot of it has to do with the high, high sugar intake. Love the explanation of the healthy benefits. Can't wait to give this a whirl. Should step 2 say parsnips? It says zucchini. Thanks for catching that mistake, I've updated it! Sounds great. I don't understand why you would want to put olive oil on top of an oily fish to begin with. I don't understand why you can't use the vegetable broth to cook the leeks, red pepper flakes and garlic along with the parsnips rather than more olive oil (which was left out of the ingredients list). I love your recipes but in general, I think too many cooks add TOO much oil to cooking when it isn't really necessary. My favorite example is when someone (not necessarily you) add olive oil to a pan just to brown ground beef which has PLENTY of fat to brown it already. 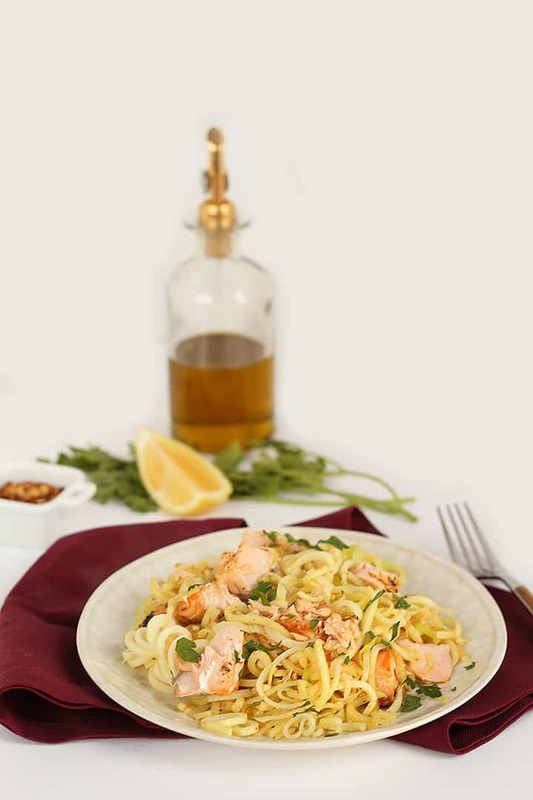 Judith - olive oil is a healthy fat source and it enhances the flavors of foods. Growing up in an Italian American household, olive oil was always used to cook, so I guess I've adopted that! I realize a lot of people say that but in reality, the USDA nutrition analysis says the omega 6 fats (the inflammation causing ones) are 10 times greater than omega 3 fats (the healthy ones) per tablespoon so I'm not so sure it is that healthy a fat. I'm just questioning the necessity of the fat to be the ONLY thing to cook a food. Even healthy fat calories add up very, very quickly. The knee jerk, cheffy thing seems to be put the oil in and THEN cook the food when a lot of food will cook just fine without oil/fat that ends up where we don't seem to want our bodies to store those extra calories. Just something to think about..
Oil is definitely a controversial nutritional topic, but at the end of the day, it's total personal preference! 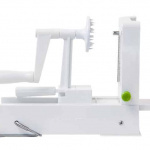 My spiralizer blade gets stuck in the machine and I can't get it out. My daughter also has this problem. Does this happen to anyone else? Yes and when it does, I just use my thumb in the front noodle side and muscle it out. I have tried that but I am afraid I am going to break it. 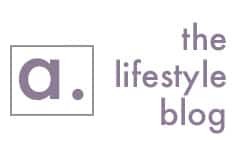 What area is it getting stuck into? 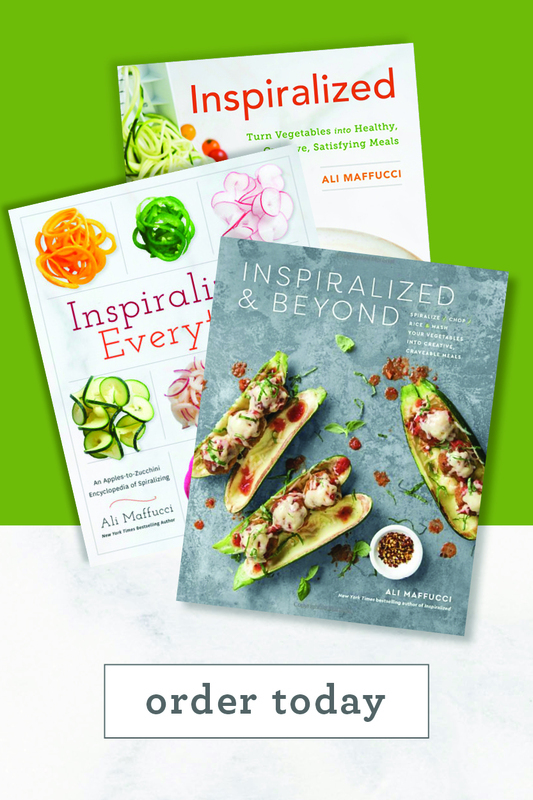 Which spiralizer do you have? I have the Paderno Tri Blade spiralizer. My blade is stuck in the cutting part. I can only make medium noodles. I have the Paderno also and the thin noodle blade is stuck in cutting position. This is so frustrating because I love to spiralize. I have the Paderno 3 blade. The small blade is stuck in the cutting position and I can 't get it out to change blade. So frustrating. There is a little tab on the blade piece that fits into a slot, push on the plastic near the slot to allow the tab to come free and pull, should come right out. Also make sure when you hold it down that you are holding the long flat part and not the very top cuz you'll hold the blade in place, I've done that a few times. 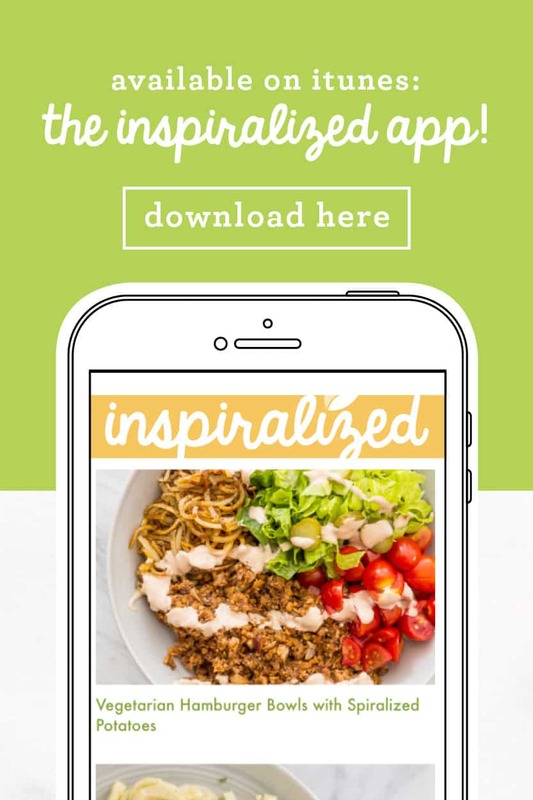 You know what I love about your recipes (besides the fact that they use the sprializer and are YUMMY)? You write them for 1 or 2 servings; just perfect for those of us who are solo. Thanks! 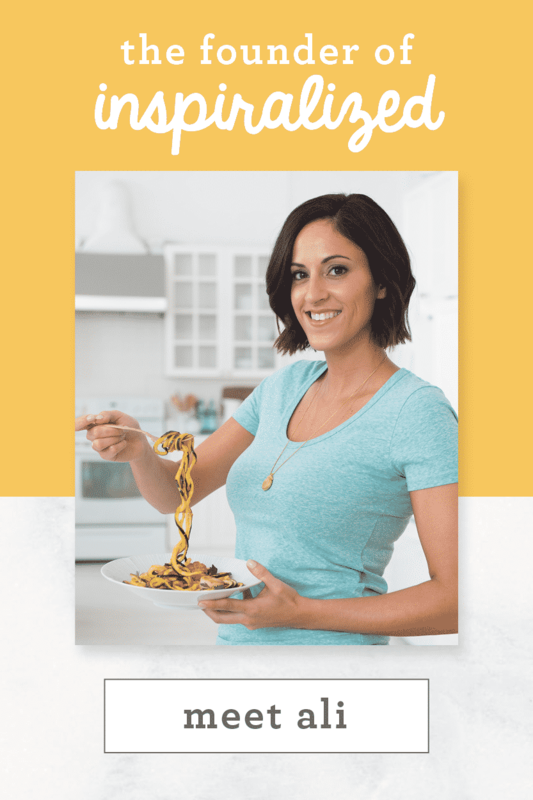 Yes, she has the most creative recipes I've seen using the spiralizer. Her creativity and teaching others how to use it on any vegetable that lays there long enough is unique. I understand not wanting to break your spirilizer blade but what it takes is steady pressure to get the blade to release. When you insert the blade it also requires just a little downward pressure to get it to "lock" into place. You have to reverse that small amount of downward pressure to get it to release upward. Use both thumbs and steady upward pressure in the top of the blade plastic housing curve. Also, make certain there isn't any leftover noodle pieces that can be jamming the works so to speak. They usually congregate on the open metal slicer section of the blade and not the shredder side of the blade. Hope this helps. I use the tip of a sharp knife at the base of the blade to lever it up-works like a charm. Great dish! Added some fresh shredded parm cheese on top yum! Thank you ever so much for these recipes. Coming back to normal from a terrible year of illness and so finding food quite tricky but these are great since they're very gentle on the tum; so light yet interesting! Life savers, literally! My first crop share of the season came with parsnip and leek so this was a no brainer. I garnished with some scallions because that too was in my weekly share and I grilled my salmon. Delicious! Parsnips have a slight sweet taste because they are loaded with carbs including starch that turns to blood sugar in your mouth as soon as it meets the amylase enzyme in your saliva. One medium parship has 13 of its 27 grams carbs in a single parsnip as starch and that makes the recipe 46% starch. I would personally go back to using zucchini or some other veggie that is a low starch veggie. But this might not make it past moderation.